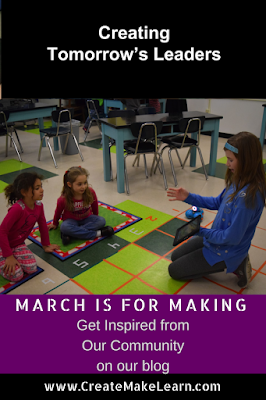 Today's March is for Making inspiration(30 post in 30 days) comes from guest blogger, Erica Bertucci of St. Albans City School. 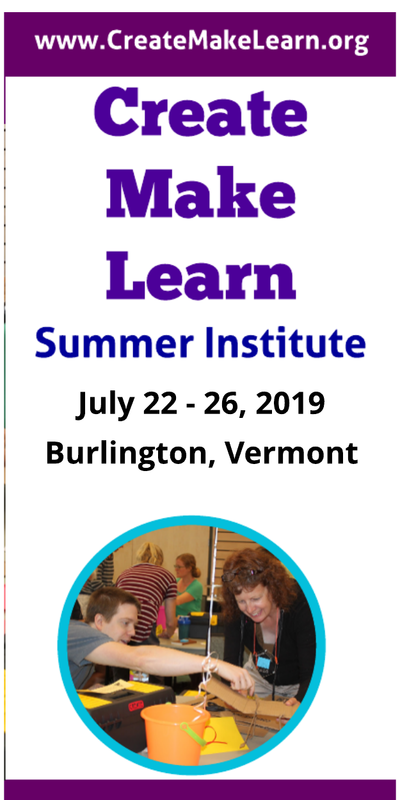 Erica will be offering a student leadership camp as part of Create Make Learn Summer Institute. 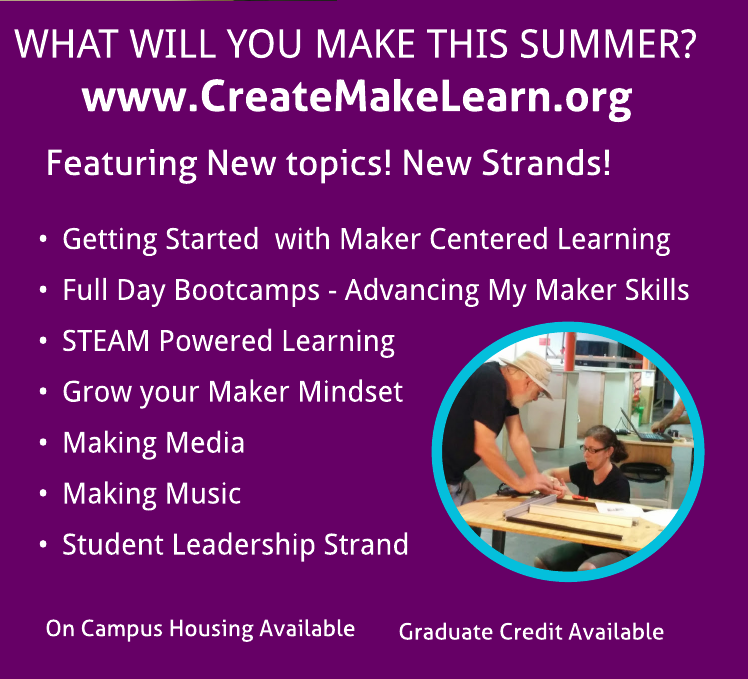 If you would to grow your students leadership skills to support making in your school, check out the new student leadership strand at Create Make Learn. 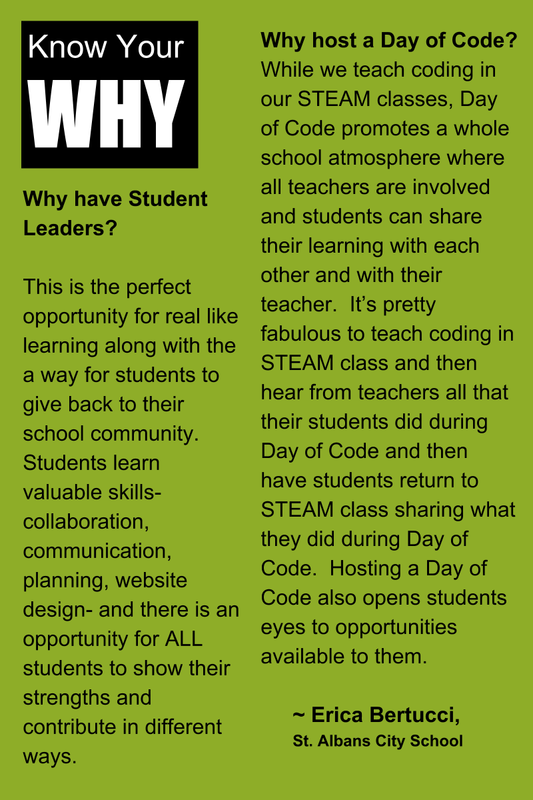 Your students will come back with new making skills as well as new leadership skills to support making in your school. 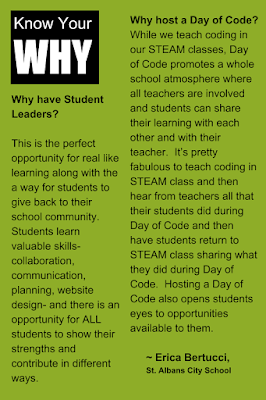 As I sit to write this entry, I realize that I never really sat and fully reflected on the experience of facilitating a group of sixteen 7th and 8th graders to plan a jam packed Day of Code for our whole school (Grades PreK-8). First off, here is the background on how this came to be. I am very lucky to job-share 2 different roles at my school: 50% STEAM teacher and 50% Technology Innovation Specialist. I say job-share as my co-worker Grace Borst fills out the other 50% of each job. We get to co-teach a 7th and 8th grade elective. Last year was our first year with this job arrangement and we both wanted to add some new activities to our Day of Code event. 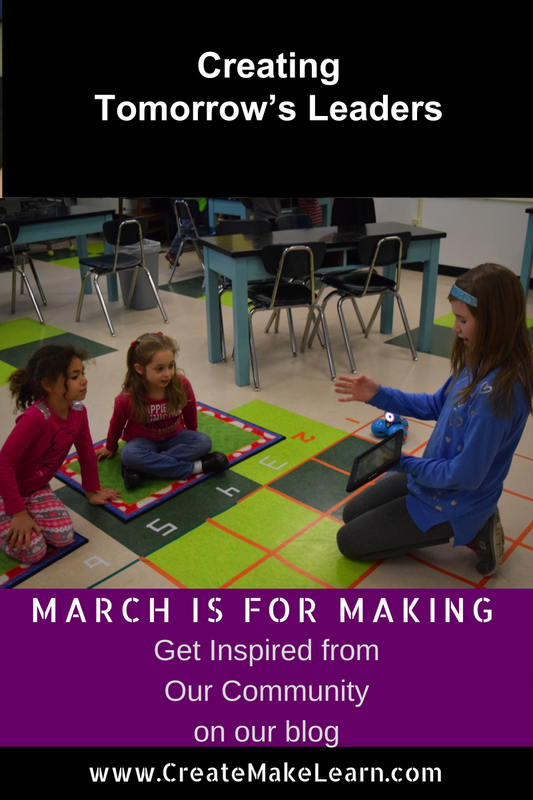 Grace took the lead on this and created some unplugged activity kits and got speakers from both Champlain College and UVM. It went really well and we had some great 7th and 8th grade student leaders but afterwards we reflected on how powerful it would be to have them more involved in the planning. And hence the creation of our ⅞ fall trimester elective: Robotics, Programming and Day of Code. We started the class by just having the students learn some of our programming tools. First, students were invited to make their scratch program come alive by using a Makey Makey. This was a great intro project as students could find success whether they had used scratch for years or had never seen it before. After Makey Makey, students were challenged to learn about one of our robots and then teach the class. For the Day of Code planning, students were divided up into committees based on their interests and went to work. Grace and I did set timelines and give expectations but then had to sit back and let the students work. We struggled at times as we both really enjoy planning and running this event and we had to remind ourselves to take a backseat on the planning and really work on the support and scaffolding for each student and not being attached to what activities they planned as long as they were appropriate. On Day of Code, we had Minecraft, UVM robotics presenters, creating stickers with code, a binary code workshop, a coding scavenger hunt, a way back machine (with items on the cutting edge of technology 20, 30 or even 50 years ago), an emulator station where you could play computer games from 30 years ago, along with unplugged and online activities happening in every classroom. teacher who they dressed up) to move through a maze. 1. One of the 8th grade robots saying how cool it was that the kindergarteners often didn’t know their left and right and would often start off just saying “go” or “turn” and that after some coaching from their robot they would start using left and right and giving a direction with a certain number of steps. 2. The ⅞ grade robots started switching roles with their kindergarten partner if there was time. At first I was weary as this wasn’t the plan, but of course then I saw how powerful it was for the ⅞ student to figure out the exact commands and that their learning helped them be a better robot the next time. Some 3rd grade students had the opportunity to create a Soroban. This workshop was led by an outside presenter, John Rouleau, who provided all the materials. He had 7th and 8th grade student helpers who quickly learned how to use a soroban and could then be seen teaching the 3rd grade. How cool was it to see the 3rd graders teaching their teachers and some of the other 7th and 8th graders. All 6th grade classes got to participate on a Makey Makey workshop led by the 4-6 committee. The student leaders taught how a Makey Makey works and then created tutorials for the students to write a program in scratch. WOW this was much more challenging than planning the event myself and just telling people what to do. Having the whole tech team on board was key. Our librarian, tech administrator and tech assistant all helped out on the day and provided the Way-Back machine, the emulator and the binary code workshop. They also helped support ⅞ leaders who were working at the emulator station and the Way-Back machine. Problem Solving- what happens if our activities aren’t ready? What do I do when the schedule was wrong and 2 classes are expecting me at the same time? What do I do when the Kindergarten class isn’t listening? Complex thinking- How do I figure out if an activity is appropriate for a certain grade? How do I give instructions that are clear and concise for an activity? A student who struggles academically really enjoyed testing out the binary code bracelet instructions and creating an example for others to see. This student also took on the role of photographer and had a schedule to make sure he got pictures of all the events. He didn’t miss anything! Two students created and facilitated a coding scavenger hunt for their peers and had fifteen 7th and 8th graders engaged and excited for this activity. Students going into their former classrooms to lead activities and give back to their former teachers. Two students being asked to help with the makey makey activity at the last minute and jumping right in to support the student leading this activity. A student who had never used Makey Makey or scratch, took the lead on creating a workshop for 6th grade students. I would never have focused on how it looked and they worked together to figure out how to add a cool design. They didn’t know each other well and they bonded over this. It was important to them. The parts they finished were the parts that made this site unique and different than our old day of code site. And I ask myself: Would I have thought to publicly recognize each student by giving them a spot in the menu and then listing what each student did? It was really fun working with these students and Grace and I enjoyed saying thank you to them by making them T-shirts using our vinyl cutter and heat press. The students were so proud to wear the T-shirts and very excited to keep them (guess they get to as we did put their name on them! ).